SW EvoStar 100ED APO Refractor: When You Demand the Best! Sky-Watcher is a leader in the design and manufacturer of ED-APO systems. 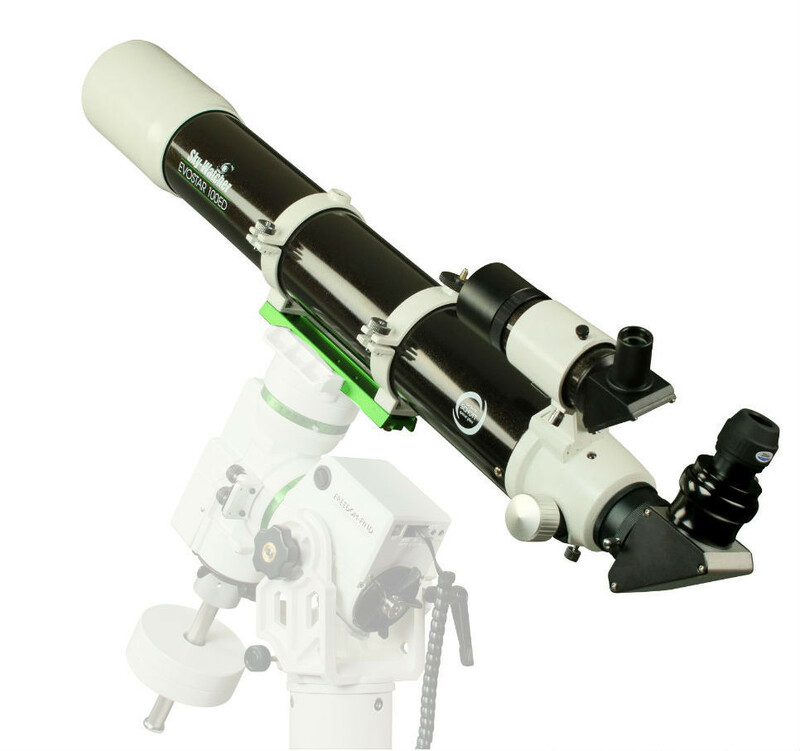 Sky-Watcher offers one of the most extensive lines of ED-APOCHROMATIC refractors in the world. 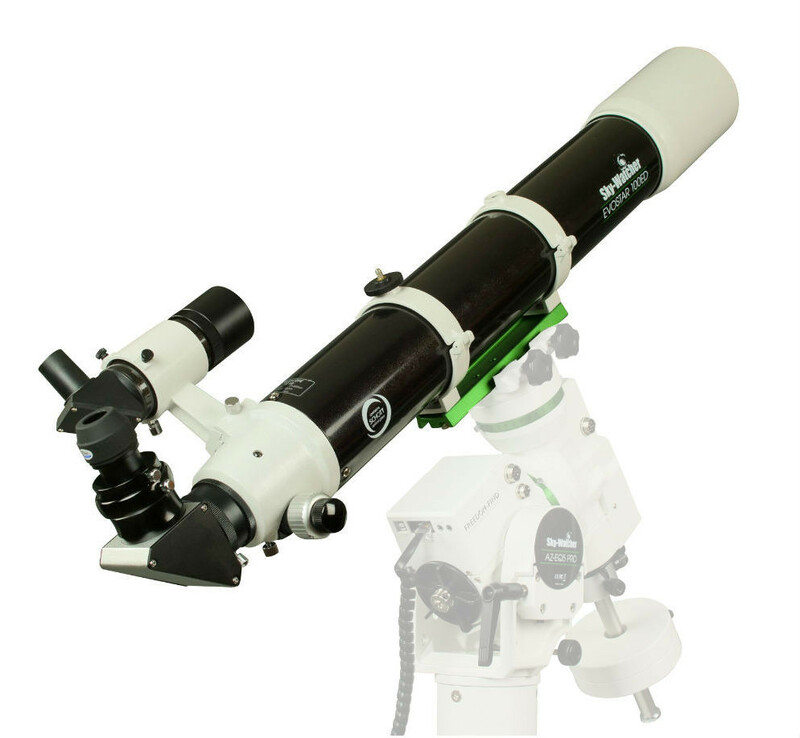 Using only the finest fabrication materials available, Sky-Watcher APO refractors are manufactured to painstakingly rigorous, exacting standards of optical and mechanical quality to insure the amateur astronomer peak performance and a great experience each and every time a Sky-Watcher ED-APO is taken into the field. We know the amateur astronomer has very high expectations regarding astronomical equipment purchases. Sky-Watcher has been delivering consistent satisfaction for decades. 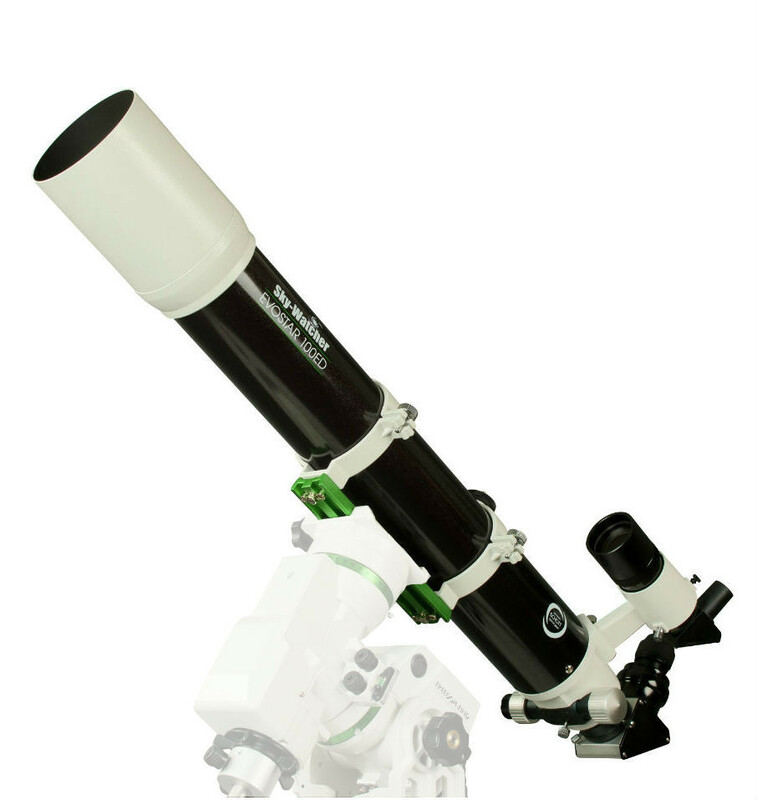 This telescope is designed for a lifetime of astronomical enjoyment! Turning the telescope to the first quarter Moon, the Apennine Mountains snap into focus revealing a cornucopia of jagged mountain ridges, canyons, and numerous small craters in razor-sharp detail. Not far removed, reaching skyward the crater wall of Archimedes pops into view in bold relief against the smooth flatlands that transverse the distance between it and the Apennine Mountains. This is lunar observing at its best – HD style. The gas giant Jupiter displays its swirling equatorial bands in high-definition with festoons, and tonality within the bands. The great spot is clearly visible, discreetly contrasted from the surrounding Jovian landscape. Saturn’s storied surface phenomenon is simply stunning. Hunt down double stars like Epsilon Lyrae, the “double-double” in Lyra. 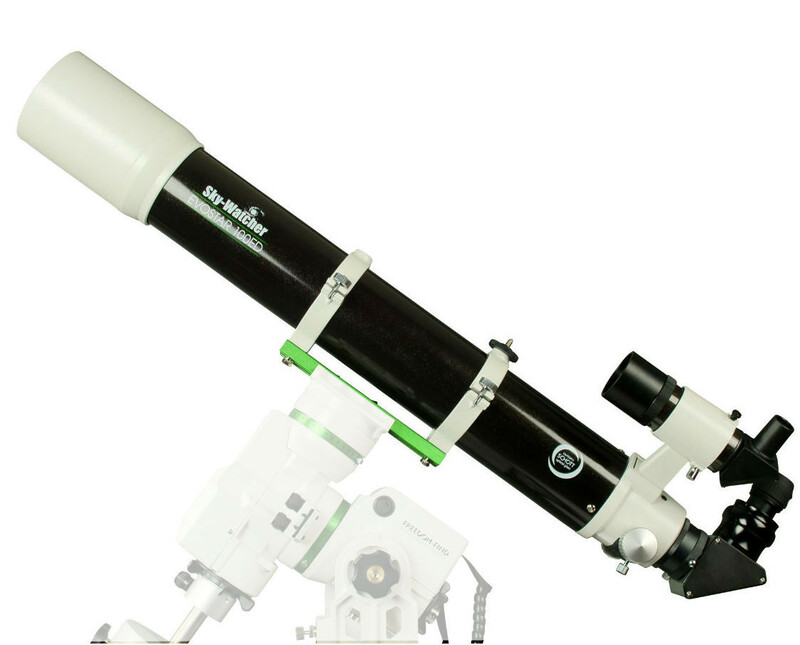 A 100mm refractor will provide a crisp well defined image superior to even a larger reflector. Always a star-party favorite, Alberio located in the tail of Cygnus never fails to please as it is a beautiful double. Alberio appears like a gold sparkler and its companion looks blue-green. It is a perfect refractor object. Compact globular star clusters lend themselves well to a refractor. Located outside our galaxy the globular M2 will probably resolve more stars in a 4? refractor than a 6? reflector. M4, M10 and many other globular cluster can be seen well with a 100mm refractor. M13, the fantastic globular in Hercules is a stunning sight in a 100mm refractor. The bright central cores of prominent nebulae can be seen and the brightest stars can be resolved. This is just the beginning of an incredible journey of exploration possible with a SW ED-APO 100mm refractor. As an astrograph, the SW EvoStar 100ED APO performs superbly delivering crisp, high-fidelity imaging of planetary, lunar and aperture appropriate deep-space phenomenon. In a given aperture size, refractors will always exhibit sharper images than other optical designs because the refractor concentrates more light into the central airy-disk and first diffraction rings. There is no diffraction pattern interference caused by a diagonal mirror, or secondary mirror being suspended in the optical path (central obstruction) as is the case with reflectors. Sky-Watcher ED-APO refractors provide the finest images obtainable—bar none—in their design class. If you are on a quest for the ultimate in pristine, near textbook-perfect astronomical imaging, look no further! Sky-Watcher ED apochromatic refractors deliver dramatic coal-back skies and faithful, contrast-rich views of planetary and deep-space phenomenon that are second to none. Sky-Watcher ED-APO refractors are the logical choice as an investment in advanced instrumentation for exceptional viewing or photography. Every lens element is individually inspected for purity and absence of striae and other image-degrading imperfections. Every lens is pitched polished to exacting standards of optical fabrication and performance by highly skilled opticians utilizing state-of-the-art methodology and rigidly controlled optical testing procedures. The result is high-quality, diffraction-limited optics performing to the theoretical limits of their respective aperture sizes. All lenses are uniformly air-spaced in their cell housings. Each air-to-glass lens surface has exotic anti-reflection metallic coatings applied to ensure optimum light through-put. The proprietary Sky-Watcher “Metallic High-Transmission Coatings” (MHC) are the finest photon anti-rejection coatings in their class. The objective lens cell is light-baffled to reject stray, unfocused light. The draw tube is likewise baffled to insure optimum contrast. The tube interior is flat blackened to help prevent unfocused internal light reflections from reaching the focal plane. Optical focus is achieved by means of a mechanically ultra-smooth, backlash-free, precision 2? Crayford-style focuser-assembly with 1.25 adaptor. This focuser operates at 2 speeds for fine and ultra-fine focusing adjustments. The optical tube material is aluminum, powder-coated reflective gloss black with gold fleck accent. The front and back cells are cast-aluminum painted white, or black. The Sky-Watcher APO optical tubes come with attachment hardware that allows them to be securely fastened to compatible mounts. The quick-release tube rings provided with SW ED-APO models 80ED, 100ED and 120ED are cast-aluminum, painted white. All Sky-Watcher USA EvoStars come with 2-speed backlash-free 2” Crayford-style focusers and quality foam-lined metal carrying cases as standard equipment. EvoStars are also supplied with right-angle 8x50mm viewfinder with bracket; 2” dielectric diagonal; two 1.25” LE (Long Eye relief) eyepieces (LET20mm and LET5mm); 1.25” focuser adaptor; and tube ring attachment hardware that works with compatible mounts.